A handful of Victoria plums were one of the hauls from last week’s foraging expedition in my mother’s garden. Initially, I was going to make a plum tart with them, but then I saw Ren Behan’s easy English plum cake recipe and thought I would adapt that instead. I had to get chocolate in there of course and white seemed like the best bet to go with plums. I used my usual mix of half white and half wholemeal flour and made a couple of other minor adjustments. Whisked 4 medium eggs with 240ml sunflower oil, 225g cardamom (caster) sugar and the grated zest of an organic orange with electric beaters for a couple of minutes until thick and creamy. Sifted in 260g flour (half wholemeal, half white), 1 level tsp baking powder and 1/2 tsp bicarbonate of soda. Folded in until just combined. Stirred in 50g chopped vanillary white chocolate (G&B). Scraped batter into a 9″ sq silicone cake mould then placed the plum halves, skin side up, on top. Pressed them into the batter slightly. Allowed to cool, then mixed 1 tsp cinnamon with 2 tsp icing sugar and sifted over the cake. The cake rose beautifully producing a light and moist sponge. The chunks of white chocolate had caramelised giving a delicious occasional nugget of sweetness. This made a good contrast to the tart plums. Unfortunately they sank along with the chocolate; I had been expecting them to be visible from the top giving added interest and a nice colourful appearance. The cinnamon topping was a stroke of genius on Ren’s part giving a gorgeous spicy scent as well as an additional flavour that worked particularly well. This was such a simple and quick cake to put together with such good results, I must remember to use it again. Ren Behan has entered her cake into a competition whereby she is needing people to bake her cake and then upload a photo of it to Cook’d. Do try it if you can – there might even be prizes for those taking part. This month’s One Ingredient is plums chosen by Nazima of Franglais Kitchen. I didn’t manage to enter last month’s cucumber challenge, so I was keen to get in there with my plums this month. The challenge is co-hosted by Laura of How to Cook Good Food. I am sending this over to Bookmarked Recipes run by Jac of Tinned Tomatoes. The cake looks so light and moist…and I love the add of white chocolate. 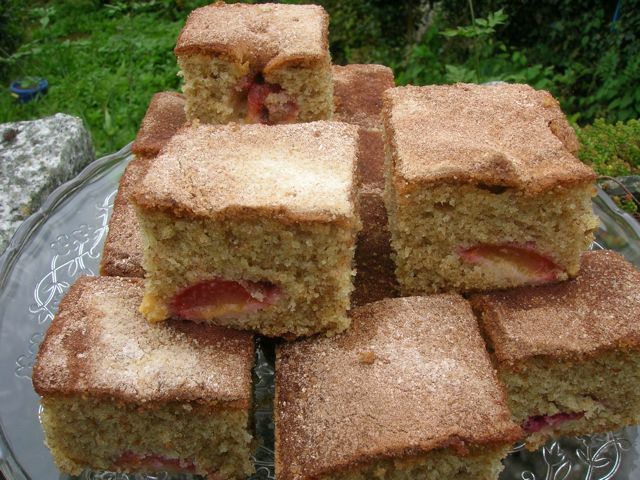 I do love a plum cake – it’s a fruit that works so well in baking. ooh looks good and I love the addition of chocolate. Yum! I know the feeling when fruit seems to sink to the bottom of a sponge. Happens to me with blackberries and raspberries and dried fruit too sometimes. But hardly matters when it tastes as good as this sounds. The cinnamon topping must really make it. A lovely entry for One Ingredient! That looks gorgeous, I love these kind of cakes. Interesting that it uses oil not butter, bet that keeps it deliciously moist too. This looks lovely! I’ve given up trying to figure out how to stop fruit from sinking to the bottom, it still tastes as good! Great cake! A lovely recipe, and your adaptation sounds super. Am sure it tasted just as good plums at top or in the cake itself! Oh, a lovely cake … yet another suggestion of what to do with my 1000 kg of plums. This week I’m having plums all over.